Witnessing the clean-up of a heavily fouled cooling tower or cooling water system can be a dramatic experience. 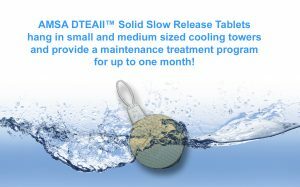 Many customers are sold on the strengths of AMSA BCP™ products to penetrate/disperse/clean biofilm in cooling water systems after seeing clean-up applications similar to the one pictured here. In fact, many customers have won accounts by performing chemical cleanings in cooling towers, chillers, and closed loop systems with AMSA chemistry. 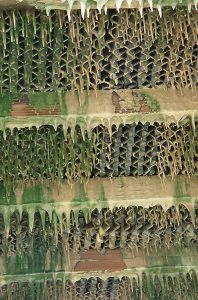 However, a good cooling tower maintenance program prevents the need for cleaning a heavily fouled system. Cooling systems that run closer to design and more efficiently. Oxidizing and non-oxidizing biocides work more effectively so that the biocide can more readily kill the bacteria with the biofilm penetration and dispersion help of BCP™ products. Clean systems are less likely to get ‘out of control’ in between service visits. Overall, adding AMSA BCP™ products routinely to a water treatment program offers water treatment service companies the security that their programs are working as designed and customer satisfaction is achieved with a well maintained cooling water system! The following video shows the value of AMSA BCP™ products in a maintenance dosing program to keep your system clean. 1) Regular slug dosing with BCP™ 1000 or BCP™ 2000 series liquid products. 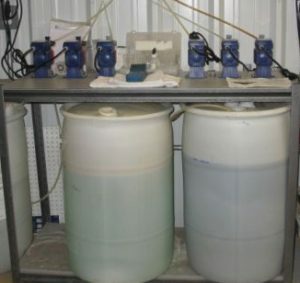 2) Continuous feeding of BCP™ liquid products. 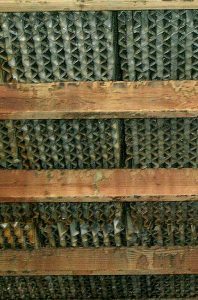 3) Hanging AMSA’s solid slow release tablets in your smaller cooling towers. 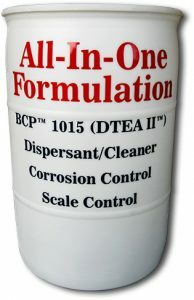 4) Feeding an All-in-One Drum formulation containing AMSA BCP™ chemistry as your scale control, corrosion inhibitor and surface cleaning solution. Esta interesante este control de azufre, en aguas geotérmicas torres de enfriamiento. favor enviarme sus catalogos de tratamiento y costo unitario del BPCtm 5000, para remover depósitos azufre en los fill de la torre enfriamiento .